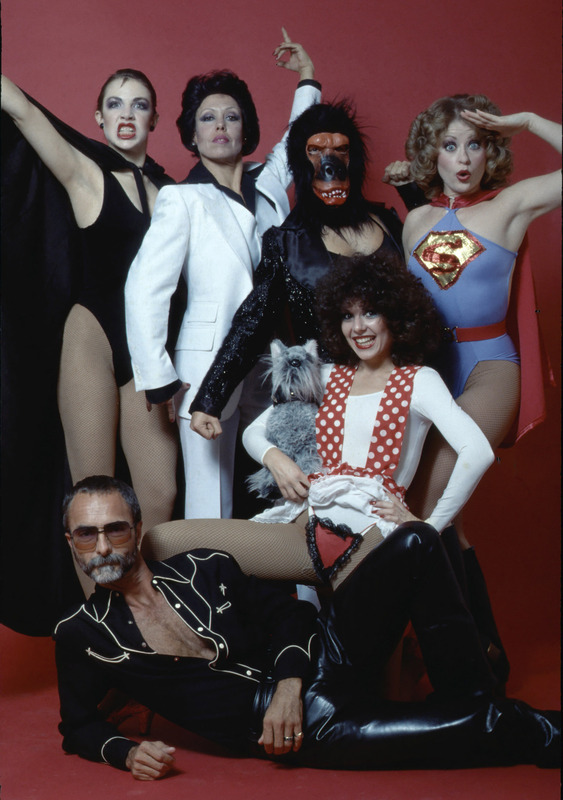 For this photo session from August 1982, in fashionable black outfits for the opening number “Rapture”, we find that 3 favorite dancers have come back into the L. A. Knockers line-up: Kim Blank, Kimberlee Carlson and Marilyn Corwin. Then we have 3 new dancers: Lisa Lecover (Kessler), Suzi Lonergan, Dee Dee Rescher. See a photo of the three of them below. And the blonde bombshell Marilyn Corwin happily back and dancing with Becky Jordan. 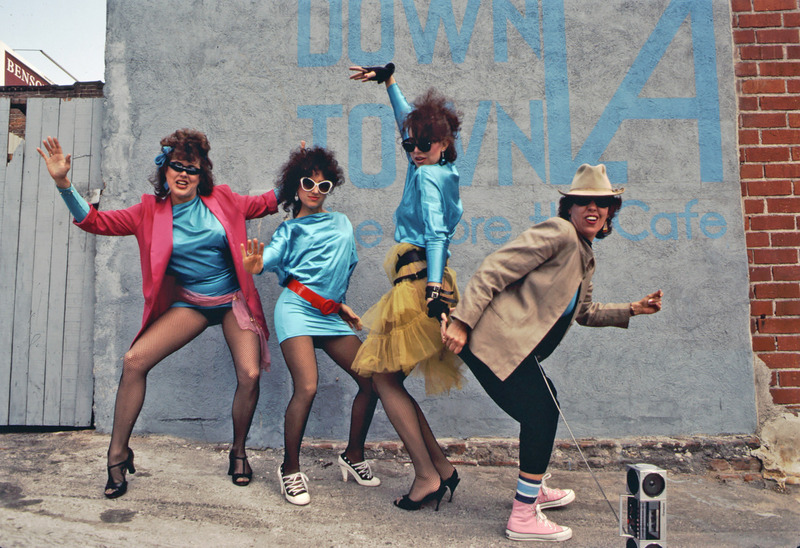 On March 30, 1984, 100 photographers documented the city for the book “24 Hours in the Life of Los Angeles”. I was one of them and asked the L.A. Knockers if they would pose for me downtown. 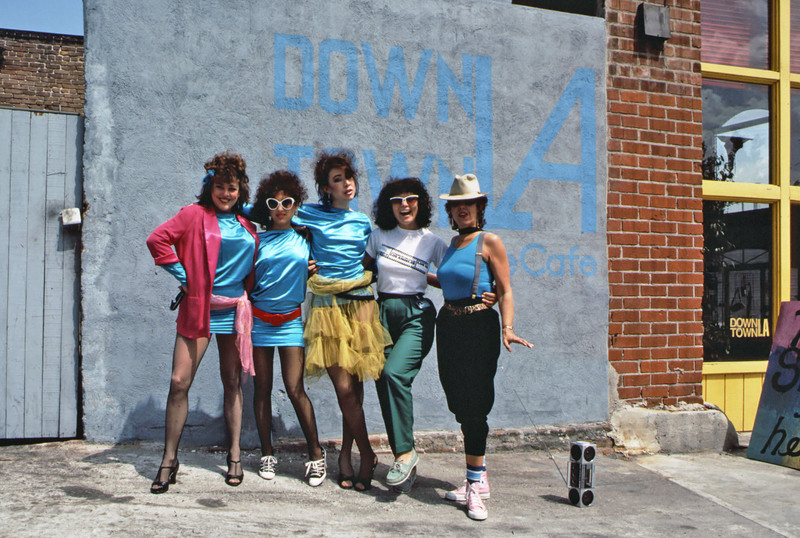 Jennifer graciously consented, so here they are, dancing at the Downtown L.A. Cafe (Dee Dee Rescher, Liz Brody, Kimberlee Carlson, Jennifer Stace) and in front of City Hall. By the way, we’d like to find Liz Brody. She’s from New York, does anyone know how to contact her? I wrote an article about this event for the ASMP newsletter (American Society of Magazine Photographers) and a personal account of my experience, this is what I said about the L.A. Knockers. “This all girls dance group invented and choreographed by Jennifer Stace has been performing in Los Angeles for the last 10 years, always funky and outrageous and constantly avant-garde. And here’s a self-portrait of your truly, Elisa Leonelli, the photographer, striking a pose with the dancing girls. Next stay tuned for individual pages. Please send us your memories and comments, tell us what you’re up to now!